Owners Report Tricky start with no wind and a strong tide underneath us but the benefit of a timed run had us over the line first and an interesting tide induced beat to get between Snowden and one of the two Prince Consort buoys (one on station & one on deck of the Trinity House ship). Breeze filled in soon after passing inside the first mark and a excellent sheets eased run to the forts and on to Winner. Beat back up to Warner then up with the new kite but as this was only the second time we had launched it over the rail managed to flick the snap shackle off and lost the halyard up the mast, quick swap to the spare halyard and we were away. Good speed out of the new kite and were holding Alchemist and not being closed down by Blazer (Laser 28) but it could not last and had to drop just before Osborne Bay. Very fluky conditions getting into Cowes Roads and held up by a cruiser which compromised our rounding of Snowden as we got rolled by three bigger boats which probably lost us the win. Still 2nd not bad and showed good speed compared to Blazer in most conditions. 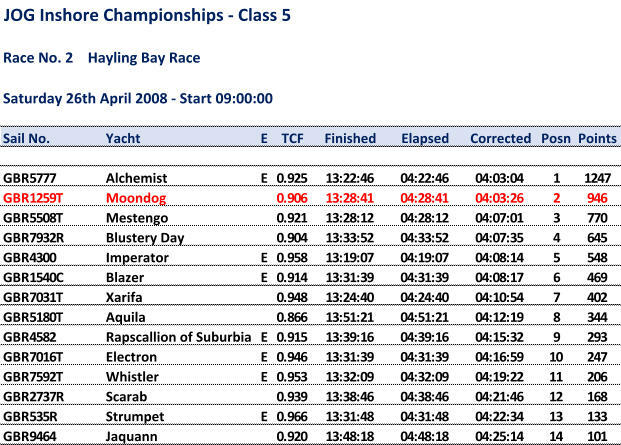 Helms Report For this race Robin Lawton, the previous owner of Moondog when the boat was named Lazy Bear, joined us. It was nice to see Robin back Jogging and helping us to sail the boat well. With the prospect of nil wind at the start we did a timed drift from a transit to the line which came out at exactly 5 minutes. Adding a bit for luck we drifted from the transit to the line and had to dip a bit to avoid starting early and got a pretty good start albeit a bit close to the shore. The tide induced wind enabled us to tack and make our way out to Snowden dicing with Alchemist and Xarifa on the way . Soon after passing Snowden the wind patches appeared on the water both ahead and inshore, no chance of heading for them so just had to wait for the increased breeze to arrive. Little bit of angst when we saw Blazer, further inshore, pick up the breeze nice and early however, we all came out pretty level in the new breeze. Sheets eased all the way to Winner with one decision on which side to pass the container ship coming up the Solent, we chose to the north and honours appeared even with those to the south once the ship had passed. Now reaching along in glorious sunshine reminded us of what fair weather yacht racing is all about, may it continue through many more races this year. We were very pleased to stick close to Alchemist and hold our own with Blazer. Once round Warner it was kite time, first time for the new chute and a bit of a moment when the halyard freed itself from the head on the hoist, quickly attaching the spare genoa halyard and hoisting with that saved the day. Speed with the new kite was pleasingly good, pulling out a bit on Blazer and seemingly holding Alchemist to a respectable distance ahead. It felt like we were on for a good result until!!!! Wind headed soon after Ryde and we returned to white sails for the fetch back to the finish. After the comings and goings getting past Castle Point we were still well placed having retaken Mestengo, things started to go wrong on the approach to Snowden. A largeish cruiser came through ahead, making for Cowes entrance, forcing us to dip and take dirty air, then three boats from classes 3 and 4 came through to windward, slowing us again on the approach and rounding of Snowden. The beat to the finish seemed fraught with whenever we tacked we were headed making a very slow last half mile. Mestengo got by and finished 30 seconds ahead, just the time we needed to get first on handicap however, coming second to Alchemist by 22 seconds was a very pleasing result. Can't wait for next weekend's RSYC Double Handed race to Weymouth and back hoping for a very extended spinnaker run with the new kite and hopefully on the proper halyard! Great race, great weather, great result.